I like lively debate outside the box. We have a local lawn service that employees some Latin American workers. The children work alongside the grownups. They work hard but take good breaks and quit by 4PM. I worked for my Dad in the summers and loved every minute. At the breaks, we got a donut in the morning and one Pepsi in the afternoon. Heavenly. My Dad was a history major and loved to talk about long ago and far away. He talked of the war and of growing up in The Depression. He taught me how to hammer a nail and to tighten a screw. I knew what the difference was between a wrench and a pliers. I helped him build a boat and a small horse barn. I helped him plant trees and pour cement. He taught me how to mow a lawn straight. That was the worst as my wandering mind and boredom led me to start making circles instead of lines. Then I would get hollered at. I’ve changed my mind about education. From where did I really get my learning? I read a lot of books from the local public library. My parents bought an encyclopedia and a huge book on the Civil War. I know that Robert E. Lee’s horse was named Traveler because I read a book about it. At the same time I learned to question what I was reading. Mostly I learned from the stories my Dad and Mom told me of how they grew up in vastly different ways. I’m pretty sure I would have been fine without being stuck in a cinder block cell called a school room for 7 hours a day. I had the fortune to be raised on the grounds of the school for the handicapped that my Dad ran. So I followed him like a puppy dog my mother said anytime I got the chance. My Dad wasn’t stuck behind his desk all day in some far away office is some building in downtown Chicago. Yes, I was fortunate. He didn’t make a lot of money, but he had plenty of time for me. I think that all children should have parents who have plenty of time. There is child labor abuse like having little children work in coal mines. But then there was also adult labor abuse in those mines. Back breaking work in the fields in hot weather with no breaks is abuse. But so is sitting in a cement box all day being taught to take tests. In Dimitry Orlov’s “The Five Stages of Collapse” he tells the story of how he as a young boy in the Soviet Union would fake an illness so he was sent home for weeks. There his grandmother would home school him for 3 to 4 hours and the rest of the time he would sled or play fetch with his dog. He also read a lot of books. His desk mate at school turned out to be a gypsy who scoffed at book reading and said that none of that was real and that his people kept everything in their head. The powers that be hate leisure time for the riff raff. Leisure is for for the elite. Work is for the little people (to paraphrase Leona Helmsley). And if they have too much leisure time it leads them to question the prevailing order of things. The whole hierarchy thing comes into question. Why do some people get to loll around while others have to work their butts off? Yeh, why? I was fortunate. I got to do meaningful work spending time with my Dad. I want that for everybody. 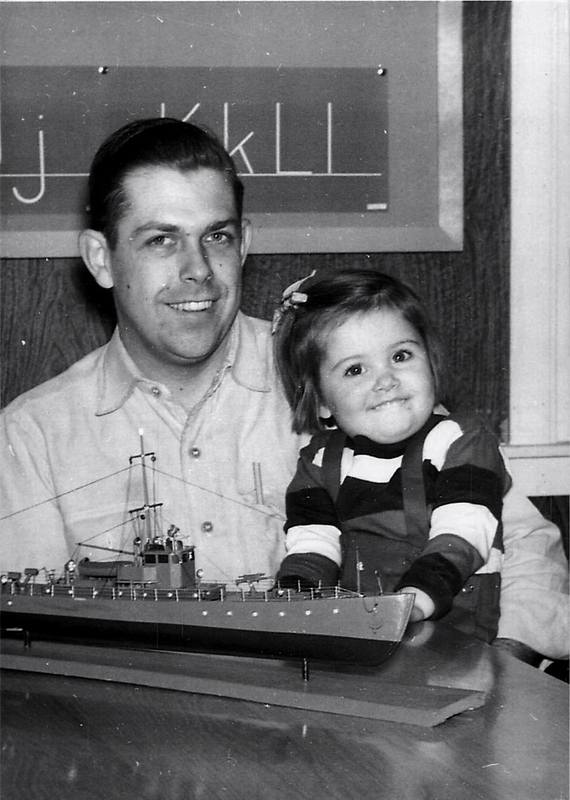 Me and Dad with the model ship “we” put together in the classroom where he taught his first classes at the Elim Christian School for the Exceptional Child. My father was quoted as saying “Children should be custom made not mass produced.” The children at his school learned to make a car, build a boat, cut and bale the hay field, take care of 2 steers and 5 horses along with reading, writing, and ‘rithmetic. This entry was posted in Montana Life, Social Commentary and tagged education, leisure, Montana, parents, work. Bookmark the permalink. Can’t argue with anything here, that’s for sure, though it isn’t easy to find people to engage in lively debate outside the box. It gets lonely sometimes. I’m looking into the Commoning movement and I discovered that Elinor Ostrom’s husband was influenced by von Hayek and von Mises. Hmmmmm …. I revisited right-wing libertarianism and discovered that they’re big on anarchism. Hmmmmm …. Then, I read a little book about the agricultural history of England by Joann Thirsk, which made me dig a bit deeper. That led to the Caliban and the Witch, by Sylvia Federici and, being retired, I thought I’d get it inter-library loan. But the PTB want to cut the number of libraries here from 49 to 27 and inter-library loan is on the chopping block. Then, it dawned on me that I might have check-out privileges from the local university, since I graduated from it. Bingo! I’m making a list that Santa would not approve of. He wouldn’t approve of autodidacts.